One House. Two families. 180 years of History. The history of this two-story log farmhouse in many ways chronicles the history of the village. Built for/by John Torney, the building was home to Mr. Torney, his wife, 10 children and various workers. It was from here that Mr. Torney ran his farm and tannery. After it was sold to William Hemphill, it housed six generations of his family until it was sold in 2012. These two families typified the work ethic and spirit present among many inhabitants of the village. Both families have an interesting story to tell. Much of what we know about the Torney family comes from a newspaper article that appeared in the Ottawa Citizen, in 1924. The article chronicles the reminiscences of Miss Isabelle Wills, a granddaughter of John Torney. According to Miss Wills, John Alfred Torney was a man “of some means” who arrived in Hull in 1812 (however on the 1842 census, Torney is listed as being in Canada for 22 years which seems consistent with his age) and worked there until he moved to Richmond in 1822. Before moving, he married Isabella Harriet Foster, a niece of John Scott of Nepean. It is said that the wedding took place at Richmond Landing (Nepean Point near the present day Lebreton Flats) with Mr. Torney bringing the minister with him from across the river in Hull. Upon his arrival in Richmond, Mr. Torney opened a tannery and began a farm, both of which seem to have prospered. The site of the Torney home (lot 13 east side of Fowler St) was transferred from the Crown to John Turney (Torney) in February 1834 but we do not know when he built his log home. The house is unique in the village as it appears that few two-storey log homes were constructed and none remain today. The next 10 years John Torney accumulated the Patent deeds for another 21 acres of land within the village limits, and the Census of 1842 listed John Tirney (Torney), tanner, as owning 115 acres. Although the 1842 entries are not always reliable, the Torney household (including servants and workers) seems to have been enormous with 18 members. Of this number 7 were children. Three people were listed as non-resident family members. This is not surprising as Miss Wills recounts that in the early 1840’s John Alfred Torney Jr. was a student at McGill and after graduation he took a contract for building the first telegraph line between Bytown and Montreal. Miss Wills also says that the second oldest son, Hugh, also graduated from McGill around the same time and became a lawyer in Bytown. In 1842, much about the family farm seems typical for the area except for the potato harvest – 1300- bushels. The farm prospered and in the 1852 Census John Torney is listed as a tanner, as is one of his employees, and he has an apprentice. He has at least one other hired man running the farm as well as a female servant. By 1861, the now 63 year-old John Turney (Torney) is still a tanner as are his two youngest sons. He has one other tanner and one labourer working for him, and two female servants. Mitchell’s 1864 Directory listed John Torney as a “leather manufacturer” on Murray St. Had he moved from Fowler St.? From the village? His name does not appear on the 1871 census. Miss Wills tells us that he moved to Merivale. But John Torney contributed more to the village than just his farm and trade skills. He and his family were strong supporters of St. John’s Anglican Church and all contributed generously to the building of the present church in 1860. Lovell’s Canadian Directory for 1857-1858 listed Mr. Torney as a village councillor. The property was deeded to William Hemphill in 1875 and remained in the Hemphill family until 2012. William Hemphill was not new to the village. The 1861 census listed William Himpell (Hemphill) as a servant; he, his wife, Mary, and son, John A. were living with the Lyon family. His name appears in Mitchell’s Directory of 1864 as a tanner but no address is given. In 1871 William was a tanner living with his wife and 5 children in his own home. In the 1880’s William Hemphill began to expand his holdings and owned not only the house and tannery but also the block directly west of his house. Although Morrey’s Directory of 1899 listed William Hemphill as a tanner, he identified himself as farmer/tanner in the 1891 census. William’s son, also William, concentrated on farming and amassed a large area of land within the village. The tannery fell into disuse and no remnants remain. 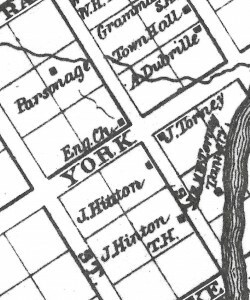 Mrs. Jean Meakin, William Hemphill’s granddaughter, recounted that at one time, as well as the main property, William owned a large portion of the original Estate of George Lyon south-west of the corner of Ottawa & Fortune Streets, fields east of McBean Street near Ottawa Street, and a hundred acre bush lot west of the village near the intersection of Joy Side Road and Ottawa Street. A prominent community member, William was the village Reeve for 12 years, president of the cheese factory on Lennox St. from 1928 until 1949, and a founding member of the Richmond Hydro Commission. One event he had the dubious distinction of attending was the bank robbery of 1938. He was a customer in the bank when it was robbed at gunpoint. This was an event talked about in the village for decades. Another son of the elder William, John, was the village postmaster from 1912-1941. The house on Fowler St. was passed to William Horace Hemphill, son of William Jr. Horace continued farming and maintained a herd of about 30 cows with the help of hired men. In the mid twentieth century, many Richmond households awoke to the sound of clinking bottles as Mr. Hemphill delivered milk from his dairy to villagers’ front porches. It was a business he began almost by accident when one local lady asked him to provide milk for her family, the word passed quickly, and soon he had many customers. After the death of Horace Hemphill in 1972, all signs of the business disappeared and the house became a simple residence of first his widow and then his granddaughter and her family. This two-storey Ontario Log house has been covered over time with stucco & clapboard. Its symmetrical design and central hall plan are consistent with that of a pioneer Ontario farmhouse. The house has had considerable interior renovation: it started with a central hall plan with 2 rooms on each side and 4 bedrooms upstairs, then it was divided in the middle to make 2 houses side by side, after 1970 it became a duplex with one family up and one down, and then about 1990 the interior was restored to its original configuration and an addition was built at the rear. The addition has a wall in which the original logs have been exposed. “Old Time Stuff”. The Evening Citizen, Feb 7, 1924. “Hemphill” file in GTHS files at Richmond Library. Interviews with Jean Meakin, daughter of Horace Hemphill and Jennifer O’Heron, granddaughter of Horace Hemphill, April 30, 2009. Menger, J. ” Social Life in the Village”, Richmond: South Carleton High School. nd. “Mitchell & Co.’s County of Carleton and Ottawa City Directory for 1864-1865.” Toronto: 1864. Neville, George and Iris Neville. “St John’s Anglican Cemetery”. Ottawa: Ottawa Branch, Ontario Genealogical Society, 1975. Stanzel, Jim. “Land Patent Holders Goulbourn Township and Village of Richmond”. Ottawa: Ottawa Branch, The Ontario Genealogical Society, 2001. Walling, H.F. “Map of the County of Carleton, Canada West” Prescott: 1863. This entry was posted in Locations and tagged Farm, Industry, tannery. Bookmark the permalink.